This is a statement issued by the Democratic Alliance. Tomorrow, 1 June 2012, DA Shadow Deputy Minister for Agriculture, Forestry and Fisheries, Pieter Van Dalen MP and DA member on the Private Members Bill Committee, Patricia Kopane MP, will host a press conference at the Hout Bay harbour. Van Dalen and Kopane will present the DA’s legislative proposal to make the ownership and management of small harbours a municipal (instead of a national) competence. The Constitution declares small harbours a municipal competence as per Schedule 4 (B), but no legislation currently exists to give effect to this provision. The poor state of the Hout Bay harbour is evidence that national government is not managing small harbours as it should. This is to the detriment of thousands of people who rely on well-functioning harbours for their livelihoods. Meeting point: Hout Bay harbour, pier near Snoekies Restaurant, Cape Town. The Democratic Alliance has issued the following statement. More than 5000 workers in the local hake industry face unemployment if the Department of Agriculture Forestry and Fisheries (DAFF) continues to ignore the requirements of the international Marine Stewardship Council (MSC). Major retailers in key SA export markets only accept products certified by the MSC. South Africa’s hake industry stands to lose its certification as Minister Tina Joemat-Pettersson’s department is failing to ensure compliance to key MSC requirements. Most pressing of these is the fact that since the beginning of 2012, there have been no observers placed on hake fishing vessels and that patrols intended to inform the total allowable catch (TAC) are not being conducted as required. Minister Joemat-Pettersson have given repeated assurances that research and observer programmes will not be negatively affected by the shambles that her department has made of the tender for fishing patrols and the current memorandum of understanding for the navy to take over certain functions with regard to patrols and observer programmes. In a performance report presented to the Portfolio Committee on Agriculture Forestry and Fisheries by the DAFF yesterday, the Department has, however, confirmed that March/ April survey has been cancelled and that the scientific observer programme has been terminated. The Department’s own briefing indicates that this will have “an immediate impact on the TACs for 2013” and will have a “long-term negative effect on the industry by compromising its MSC certification”. The industry annually produces around 110 000 tons of fish and generates more than R5 billion in economic value. Half of this is generated through exports that are now in jeopardy because of the questions raised around our MSC certification. I will be submitting parliamentary questions to ascertain when observers will again be placed on vessels and what steps the department is taking to ensure continued MSC certification for South African fisheries. With more than a quarter of South Africans currently unemployed, this government should be doing everything it can to protect and promote labour intensive industries. Minister Joemat-Pettersson appears increasingly incapable of resolving the issues in her department which are placing key industries at risk. A recent judgement by the Willowvale Magistrates Court (Case No. E382/10) in State v David Gongqoze and 2 Others has been reported by, inter alia, the Business Day newspaper as a seminal judgement affirming traditional fishing rights. The spectre was raised that this case allowed for some constitutionally protected right for fishing communities to fish in marine protected areas. If fishing communities have some constitutionally protected right to fish in MPA, they would certainly have free access to fish anywhere else then. This would of course be unlawful under the Marine Living Resources Act and would be contrary to a raft of international policies and soft laws on fisheries management. Thankfully, the judgement does not recognise customary fishing rights to trump national fisheries law. What it does recognise in passing is that where national and provincial government departments promise and undertake to recognise and protect certain access rights, then these should be respected. The court in fact found the accused to be guilty of contravening the provisions of section 43 of the Marine Living Resources Act in that they unlawfully fished in an MPA without a permit. In this regard, the court pointedly referred to a June 2001 agreement concluded between members of the Dwesa-Cweba community and representatives of, inter alia, the erstwhile Department of Environmental Affairs and Tourism to allow community members some level of access to the fish stocks in the MPA which was essentially unilaterally declared in 2000. The court also referred to a 2009 promise and undertaking provided by Dr Alan Boyd of the department of environmental affairs where he promises to re-open a section of the coast for fishing and where Boyd then commissions an evaluation of opening of the MPA by Dr. Peter Fielding who subsequently recommends against such opening! So, the Gongqoze judgement does confirm that the provisions of the MLRA, and particularly section 43 pertaining to MPA, must be enforced; that fishing in an MPA without a permit is illegal and customary or traditional fishing “rights” do not trump any provision of the MLRA. The judgement furthermore highlights the poverty and exclusion of, and the extent to which governments (in the national, provincial and local spheres) have failed rural coastal communities. Populist, empty promises about access to resources are currently again being made by the Minister of Fisheries in the small scale fisheries policy. The result however is the creation of false hope, forced poaching and biological destruction resulting in increased poverty. Feike’s blog readership continues to grow. Today we recorded one of the highest daily readerships ever as shown below. Our readers are predominantly South African, followed by US and UK – based readers. We also have a core following in Norway, Spain and Russia. On 15 May 2012, the Department of Environmental Affairs delivered a report on its white shark research capabilities, budgets and capacity to the Western Cape legislature (Standing Committees on Environmental Planning and Community Safety). The interrogation of DEA’s research technics and abilities was prompted by the recent uproar against the issuing of “research” permits to the controversial Ocearch fisheries project and the fatal shark attack at Koggel Bay. DEA’s presentation, led by Monde Mayekiso, Alan Boyd, Hermann Oosthuizen and Mike Meyer was thorough and impressive and clarified much. DEA’s has a paltry R2 million white shark research budget and 1 dedicated research scientist. It was however noted that DEA relied on a network of research professionals in South Africa and abroad to enable it to deliver on its mandate. The joint standing committee concluded that it was their view that DEA required an increased white shark research budget and that the department ought to re-evaluate the manner in which it communicated with the white shark cage diving industry and the broader community on white shark research and activity. The DEA was also requested by Mariette Hopley, chairperson of the Great White Shark Protection Foundation, to work more closely with the foundation and the white shark cage diving industry. On 15 May 2012 the Department of Fisheries held its Cape Town “dialogue” with members of the South African fishing industry at the Ritz Hotel in Sea Point. The Department was represented by its Acting Deputy Director-General, Mona Mashaba (the 7th acting DDG since Dec 2010), the director of “stakeholder” liaison, the acting Chief Director of Fisheries Management and the Chief Director of Compliance. It is worth noting that Dr Mashaba is not a “new” Acting DDG as this is his second stint as Acting DDG of Fisheries. His first was when he temporarily replaced Monde Mayekiso in December 2010. To be honest, the Department made its usual slide presentation on what its key objectives are and used all the catchy buzzz words like “stakeholders”, “partnerships” and “consultations” but frankly there was no substance and when the pressure mounted with questions especially from Feike, there was little interest in dialogue with the Chief Director of Compliance refusing to answer questions about the patrol vessels and begging the chair for “protection”! Shame. We cant understand why they call something a “dialogue” when they are more interested in a Mona logue. Coming out of this meeting, there can be little doubt that the Fisheries Branch is in a state of crisis, precipitated by a Minister who lacks any leadership skills. For example, the staff sheepishly admitted that they were forced to miss crucial international meetings because the Minister failed to authorise international trips despite a three month advance notice period! Top management vacancies continue to remain vacant because of bureaucratic “processes” (ie bungling and incompetence). Mashaba even admitted that despite having interviewed more than 5 people for the post of DDG: Fisheries Branch, selected candidates have refused the post – nobody wants the post once they realise what it involves and perhaps who they have to report to! So we at least now know that if they ever appoint a permanent DDG for Fisheries, the person will be someone completely unimpressive and unsuitable for the post but probably just desperate and glad to be employed. Small scale fishing policy: DAFF confirmed that the Small Scale Fishing Policy was adopted by Cabinet but also confirmed that they do not have an implementation plan in place although implementation is scheduled for the end of 2012. What is also apparent is that DAFF (And quite frankly no one we have spoken to) have a clear understanding of who is a “community” what are “coastal communities” and who will be part of a “community”. It is also clear that the Department does not have any idea as to where the fish will come from to support the implementation of the Small Scale Policy (perhaps their plan is to grow to poaching into its own separate economic sector – that already works very well with departmental support in the abalone fishery). But their most concerning admission was that they are “hoping” current small scale individual quota holders will “volunteer” their quotas into the “community” pot! And another 2 !! It is clear that the Department and its Minister do not reside on this side of the Milky Way. When Feike pointed out that this thinking was so far from reality that it is simply not feasible, the department’s officials simply shrugged their shoulders, no doubt having adopted their adviser – Andy Johnson’s – strategy of it fails (again) so what? Think about it. The department has pinned implementation of the policy on current small scale fishers who earn decent annual salaries from their quotas, pay taxes and employ thousands of people to simply hand their entire livelihood to the “community”! This soviet/stalinist thinking simply has no place in a modern democracy. Which small scale commercial fisher is going to hand over his entire business and his future to an undefined rabble called the “community” who will undoubtably plunder and destroy? That is because we and many others have some idea as to who the “community” is going to be! We have said it before but it must be said again: the Small Scale Fishing Policy will only lead to poverty, unemployment and resource destruction. Look at SACFC, the 6 years of the failed interim relief process and the disaster of the Doringbaai community quota pilot project. Monitoring and recording of catches: It was pointed out that the awarding of a tender to appoint a suitable catch monitoring service provider has been repeatedly delayed over the past year. The consequence of this of course has been demonstrated by the massive overcatches by the interim lobster quota holders whose catches were rarely if ever monitored and recorded. Investments by small-scale quota holders: A quota holder demanded to know that if the small scale fishing policy was implemented, what would happen to the investments made by current small-scale fishers. The department was reminded that when the long term fishing right policies were issued, quota holders were encouraged to invest in gear, equipment, jobs and vessels. What will happen to these investments? The department failed to provide any answers to this critical question other than to insist that they are “developing an implementation plan”. Section 21 transfers: The department was questioned as to why section 21 fishing right transfers remained in the doldrums. The department’s revealing answers were that they treated a transfer application like a rights application; that they had a back-log of more than 160 transfer applications; and of course they do not have sufficiently skilled legal staff. Well there are the problems! Incompetent and unsuitable staff and inappropriate evaluation criteria. Transfer applications are NOT right applications! Transfers are only subject to the criteria set out in the Transfer of Fishing Rights Policy, read with the Transfer of Rights application form, and not subject to the evaluation criteria of the General Fisheries Policy of 2005 or sector specific policies. Review anyone? Representation of fishery sectors: The Acting DDG made one of the more bizarre statements of the meeting when he stated that government would prefer to meet with one industry body instead of 22 (there are 22 commercial fishing sectors). What the Acting DDG obviously does not understand is that the fishing industry is not one homogenous grouping of people who go to sea in fishing trawlers! He was also unaware of the fact that industry had established an umbrella representative body – FISHSA – in June 2011 incorporating some 11 fishery sector representative bodies. Talk about out of his depth. Research and patrol vessels: The chief director of compliance simply refused to answer Feike’s questions on the subject but we refused to relent, interjecting and demanding a response which finally came in a series of damaging admissions, which included officials (ok actually just one official) uttering the words “SMIT Amandla”. I kid you not. Admission 1: The Africana will not be able to undertake any further surveys this year. Why that is we were not told. Did a naval officer stick an AC connector into a DC socket? Did they break it? Admission 2: The pelagic survey will be undertaken by the end of May but will be “outsourced” and a private vessel will be sourced to undertake this. Effectively this means that SMIT Amandla will no doubt be asked to crew the “private vessel” which will be paid for and sourced by the pelagic industry. (Will Tantrum Tina will play dumb after the fact and throw a tantrum and suspend someone)? Admission 3: The department is unable to say when the research and patrol vessels will get to sea (if ever). Feike understands that it is extremely unlikely that the patrol vessels will go to sea in the next 10 months leaving our oceans completely exposed to rampant and unchecked illegal fishing. So while Tantrum Tina continues to throw hissy fits at Press Clubs and debates moving fisheries from Cape Town to Pretoria to “equitably spread fish” across the country, our fish stocks are free for plunder and research is as relevant to this Minister as accountability. We also understand that since being handed over to the Navy on 30 March 2012, the vessels’ engines have never been started which would have resulted in substantial damage by now – These engines require starting every day, we are told. Tid Bits: The department also revealed a number of other objectives, which we will refer to as “tid bits”. DAFF wants to establish 3 more proclaimed fishing harbours because they stated that all of the current fishing harbours are in the Western Cape (in fact 11 are in the Western Cape and 1 in the Northern Cape at Port Nolloth but that place is quite god-forsaken and I understand the error). Although they dont seem to know where they will set up three more fishing harbours, and while we dont mind more fishing harbours (but three is quite pitiful. The Western Cape and the DA will still have 11 and the ANC only 4), the department could not explain why increase the numbers of harbours when they cant remotely manage the current 12. Just look at the shocking state of decay in the biggest and most important fishing harbour, Hout Bay. We cant understand this commitment to increase failure. But, in the words of Mel Brooks, lets end on a high note. The department confirmed that it is focussed on developing 4 new fisheries with two presently underway. Experimental permits for a resuscitated octopus fishery will be issued shortly and a whelk fishing experiment is underway (albeit that it is being conducted unlawfully in an MPA and the Department of Environmental Affairs opposes it!). The department has also identified possible commercial red-bait and red-eye fisheries. Feike has been singing this song for the last 7 years. The only way to sustainably grow participation and investment in and the economic value of the fishery sectors is to grow the number of commercial (AND not subsistence) fisheries. And lets add to these new fisheries by fast-tracking the development of sustainable commercial abalone and east coast rock lobster fisheries. Final Final: The chief director of compliance told the meeting (but directed at Feike) that we must stop behaving like journalists! I am sure that they cant wait for the Secrecy Act! On 24 April 2012, we reported that the Western Cape High Court reviewed and set aside the decision of the Environmental Affairs’ Minister to deny our client, Shark Adventures, its 5 year white shark cage diving permit. The court recently issued its reasons for the decision. We take a closer look at the reasons and consequences for the shark cage diving sector (WSCD) and the boat based whale watching sector (BBWW). Shark Adventures had approached the High Court seeking an order to set aside the Minister’s decision on two fronts. Firstly, it was argued that the Minister of Environmental Affairs simply did not have the legal authority to decide appeals pertaining to the WSCD sector as the appropriate decision-maker and repository of legal authority in terms of a presidential proclamation dated 29 January 2010 is the Fisheries Minister. Feike had raised this argument from the very start and published a number of BLOG articles stating why Environmental Affairs lacked the legal authority to regulate the WSCD and BBWW sectors. Our argument from the start was based on two basic premises. The first was that the presidential proclamation was clear in that all provisions of the MLRA were transferred to the Fisheries Minister, except for section 43 of the MLRA, which regulates marine protected areas. The second was that regulations cannot exist independently of the original legislation under which it is promulgated. The DEA argued that they did indeed have the requisite authority to regulate the WSCD and BBWW sectors as the presidential proclamation did not transfer to the Fisheries Minister the “non-consumptive uses” and conservation provisions of the MLRA and the WSCD and BBWW Regulations could in fact stand-alone and independently of the MLRA. The second ground for review was that in evaluating the Shark Adventures application, the Minister made certain reviewable errors pertaining to the scoring of criteria and ultimately the score allocated to Shark Adventures, which the Minister had considered to be “too low” to warrant a permit. On the ground of ultra vires and whether the Minister of Environmental Affairs was properly authorised to decide appeals in the WSCD sector, the court held that the Minister’s arguments that the WSCD Regulations could exist independently of the MLRA and that the President did not transfer the “non-consumptive uses” to the Fisheries Minister, could not be sustained. With respect to the Minister’s “consumptive and non-consumtive use” argument, the court rejected this pointing to a number of reasons why this reasoning was flawed. The court for example indicated that the Fisheries Minister continued to regulate the non-consumptive management of seahorses and pipefish. The Fisheries Minister also continued to set and determine the user fees to undertake WSCD and BBWW. Further, the court also considered the fact that appeals under the MLRA could only be decided in terms of section 80 of the MLRA, read with Regulation 5 of the 1998 Fisheries Regulations, which were administered by the Fisheries Minister. On the ground that the Minister erred in the manner in which Shark Adventures’ application was scored, the court held that the Minister made material factual mistakes and failed to take into account relevant considerations. The Western Cape High Court accordingly decided to authorise White Shark Adventures to continue operating as a WSCD operator in terms of its exemption (thus permitting 4 operators in the False Bay area); that the impugned proclamation must be sent back to the Presidency for reconsideration and amendment to clearly indicate which minister is authorised to deal with the WSCD sector; and once this is resolved for the proper minister to decide the appeal submitted by Shark Adventures. What does this mean for the WSCD (and BBWW) sectors? In short, the High Court’s decision does not affect the WSCD or BBWW sectors immediately. Operators shall be entitled to continue to operate but it may mean that in the near future permits may be re-issued once the Presidency attends to preparing a properly worded Proclamation stating clearly which Minister is in charge of the WSCD and BBWW sectors. In particular, it is clear that the Environmental Minister and DEA cannot lawfully issue permits under section 13 of the MLRA to WSCD (or BBWW) operators. Further, this judgement does directly affect the exclusion of exemption holders from, for example the Gansbaai area, where the Minister again excluded an exemption holder and instead allocated a permit to a new entrant. Each affected exemption holder will have to bring a separate review application to set aside the decision of the Minister of Environmental Affairs. 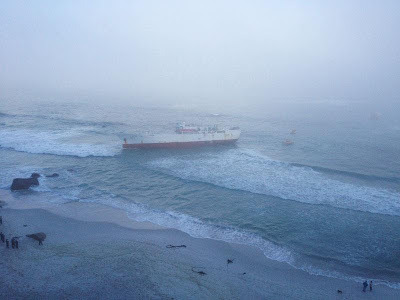 On Saturday morning (12 May 2012), the Japanese registered tuna long liner, Eiahtsu Maru, ran aground at Clifton 1st Beach at approximately 05h00. What became immediately apparent was the lack of proper management of the potential disaster scene from an environmental and fisheries management perspective. For one, because we no longer have operating patrol vessels which have anti-oil and anti-pollution mechanisms, there was absolutely no oil/fuel disaster prevention and mitigation capacity at hand. The magnificent red environmental patrol vessels were instead bobbing about in Simonstown harbour. These vessels ought to have been immediately deployed to disaster scene to assist with the removal of the crew and to ensure that any fuel spill would be contained dissipated. Secondly, where was the department of fisheries to ensure that the reported tuna on board was legally harvested? Was the fishing vessel authorised to be in SA waters? DAFF officials ought to have removed and documented the fish on board the vessel and removed the vessel’s logbooks and fishing permits and licenses. More than 36 hours after the the vessel ran aground, DAFF has yet to issue a press statement confirming the legal status of the fishing vessel, Eiahtsu Maru. The pictures below are provided courtesy of Tim Reddell. On 30 April 2012, the Minister of Fisheries and her department published its findings on the fisheries performance review process which was conducted between 2009 and 2010. Its key findings on black economic empowerment and “transformation” completely contradict the Minister’s and the Fisheries Portfolio Committee’s views on empowerment levels in the commercial and small-scale fishing sectors. The performance review documents do however strangely refer to “commercial” and “limited commercial” fishery sectors. Unfortunately, these terms are significantly outdated and have no reference in our current law. The term “limited commercial” was included in fisheries nomenclature back in the July 2001 fisheries policy to formally and legally recognise small-scale or artisinal fishers in the abalone, west coast rock lobster, line fish, oyster, mussel, trek net and hake handline sectors. But this concept was superseded with the adoption of the 2005 General Fisheries Policy and sector specific fishing policies which instead categorised fisheries into management clusters (Clusters A, B, C and D) and delineated fisheries into either offshore or nearshore fisheries, with the latter exclusively reserved for artisinal fishers. It is inexcusable that the Department could make such a blunder (yet again). Anyway, to the substance of the performance review data findings. Only right holders in the netfishery, lobster, hake handline and traditional line fishery sectors were required to participate in the performance review process. Abalone, KZN beach seine, oyster and mussel quota holders were not part of the performance review process. Only 85% of quota holders decided to participate in the process. Less than 30% of quota holders belong to recognised industry associations or bodies. This is perhaps why compliance levels are lower in the nearshore fishery sectors (especially lobster); why quota holders are unable to earn maximally for their fish as they have extremely limited market access and knowledge; and why poverty levels remain fairly high in coastal fishing towns. A key finding is that small-scale quota holders who hold their quotas as individuals (as opposed to in corporations), earned substantially more and were economically better-off than their colleagues in close corporations with up to 10 members. This once again confirms that co-operative / incorporated entities and shared quota structures in small-scale fisheries are recipes for poverty and economic hardship. Black quota holders: 72%. The Hake handline sector has lowest empowerment levels (30% of quota holders are black but see below) while the nearshore lobster quota is 93% black owned. Permit Utilisation: 50%. A mere 19% of hake handline quota holders utilised their permits between 2006 and 2009. We are not told why this is so. In the most lucrative of the small scale fishery sectors – lobster – a shocking 61% of quota holders utilised their permits between 2006 and 2009. So why are more quotas being demanded and allocated in these sectors when utilisation levels are so poor? Did the reduced size of the quotas make harvesting economically unviable? Unfortunately, the department does not provide any analysis in this regard. The only offshore commercial fishing sectors that did not participate in the performance review process were the tuna long line and swordfish long line sectors (large pelagic sector). Of the 871 quota holders, 94% participated in the review process. 89% of right holders belong to a recognised industry body or association. Black quota holders: 60,47%. It is worth noting that the two fisheries the Minister has regularly chastised as being “white” – hake trawl and small pelagics are 62.5% and 73% black owned, respectively. The lobster sector is more than 80% black owned. These figures undoubtedly confirm that the South African commercial fisheries are the most “transformed” formal economic sector in South Africa today. Calls for a fisheries charter and for “more transformation” are therefore clearly ill-informed and unwarranted. The two rounds of quota allocations in 2001 and 2005 have by and large achieved the critical and justifiable political objective of section 2(j) of the MLRA. Black Directors: 63%. In 2004, the percentage of black directors on boards of companies stood at 10%. Black Top Salary Earners: 49%. In the hake deep sea trawl sector, just under 70% of top salary earners are black. In the west coast rock lobster sector this figure is above 60% while in the comparative figure in the tuna pole and shark demersal sectors is less than 30%. Prof Mohammed Karaan of Stellenbosch University published an opinion piece in the Business Report (“Fish Catch can create jobs and sustain communities”, 8 May 2012), which raises a number of pertinent issues related to the National Development Plan (NDP) and the Small Scale Fisheries Policy that require further elucidation. We do not disagree with his analysis of the NDP and its intentions with regard to fisheries development. However, what I believe that he and many others including our current revolving door of civil servants in the department of fisheries do not fully appreciate is that South Africa has had a thriving and legally recognised small-scale commercial (or artisinal) fishery sector since July 2001. Prior to that a comprehensive socio-economic review of subsistence fishing of high value stocks such as lobsters and abalone found that subsistence fishing of high value stocks only increased poverty and illegal fishing as subsistence fishers were forced to sell their harvests illegally and because buyers knew this, substantially lower prices were offered. Subsistence fishing is a poverty trap. One need only look at coastal poverty and levels of underdevelopment in the Eastern Cape which has a de facto system of community subsistence quotas in place for abalone and east coast rock lobster. There appears to be this convenient myth that commercial fisheries is only about the large offshore fishing sector and that the small scale fisherman has been forgotten. I repeat, it is a myth confirmed by simple analysis and understanding of our fishery sectors. South Africa has 22 commercial and small scale commercial fishery sectors, which are clustered into four categories for effective management in terms of the General Fisheries Policy of 2005 promulgated by Cabinet in terms of section 85 of the Constitution. Clusters A and B comprise 15 of South Africa’s most capital intensive offshore and midwater fisheries, including hake deep sea and inshore trawl, south coast rock lobster, patagonian toothfish, KZN prawn trawl, horse mackerel, tuna long line and our pilchard and anchovy fisheries, west coast rock lobster, hake long line, tuna pole and squid. These fisheries require large investments, employ some 27000 people, and are responsible for the bulk of the R12 billion in investments in vessels and factory infrastructure in fisheries. Black ownership averages 60% across these sectors with black ownership in the lobster and hake long line fisheries over 80%. These are figures confirmed by the department of fisheries. Clusters C and D are reserved for artisinal or small scale fishers. Of the 3000 quota holders in the 22 commercial fisheries, small scale fishers are allocated more than 2200 quotas in high value, low investment requirement fisheries, such as west coast rock lobster nearshore, traditional linefish, abalone and hake handline fisheries. The small scale fisheries policy that seeks to allocate quotas to so-called communities via co-operatives is neither novel nor a solution to poverty (as some civil servants and the Fisheries Minister would have us believe). Instead, community quota structures have been tried, tested and proven to have failed repeatedly in South African fisheries history both pre and post apartheid but perhaps most spectacularly in the late 1990’s with the case of the South African Commercial Fishermans Corporation (SACF). It is incomprehensible that these lessons of failure are being ignored and willfully repeated. The SACFC fraud was perpetrated against more than 3000 artisinal fishers who to this day have never been compensated for their losses. It is perhaps mindful that people like Mr Andy Johnson who was directly involved in drafting the small scale fisheries policy (and an “adviser to the department of fisheries) and is an outspoken and ardent fan of the policy is a renowned “former” poacher, was connected to Hout Bay Fishing Industries (the largest syndicated poaching company in the history of South African fishing) and was a founding member of SACFC and the SACFC Holdings Company. The small scale fisheries policy is contradictory to the objectives and intentions of the NDP and Vision 2030. The small scale fisheries policy will undeniably result in massive poaching of inshore fish stocks resulting in massive resource collapse, substantial community conflict and infighting, not to mention fraud and corruption and will result in increased poverty. If one doubts these grave predictions, this is precisely what has resulted from the department’s chaotic, corrupt and maladministered interim relief lobster quota process which is what is envisaged by the small scale fisheries policy. In addition, simply consider the failed “community quota” pilot project in Doring Bay. Feike has repeatedly maintained that the small scale fisheries policy simply provides a second opportunity for a select few to once again line their pockets at the expense of poor coastal communities. We need simply ask if anyone of those who benefitted so substantially and unlawfully from the millions of rands earned from the SACFC quotas has been prosecuted or forced to account for the poverty caused and fraud perpetrated. Postscript: It is noted with concern that the SACFC (Pty) Ltd which was in final de-registration since 2006, had its de-registration process cancelled on 18 April 2012 according to CIPC records which is about the same time the draft policy was submitted by the Fisheries Minister to Cabinet for approval. Its registered address is the attorneys firm of Davout Wolhuter & Associates. Its current active directors include Davout Wolhuter who was implicated in the collapse of the SACFC cooperatives. SACFC is back in business according to the CIPC.